Congratulations to "Maureen C.", the winner of Winter's giveaway. Thank you to all who participated! Writing about cops has been a passion of mine. Writing about a cop who reluctantly falls in love is a topic of deep interest to me. The fact there is a Romantic Suspense/Thriller genre for me to write in makes it better. I've spent years gleaning, researching, and consulting men and women who work or worked in law enforcement to make my detective character as realistic as fictionally possible. The main character of my series Degrees of Darkness, Detective Remy LeBeau could be considered a cops cop, but he has seen a side of the job that leaves him seriously jaded. He might do his work within the confines of the law, but when pushed far enough he can cross the line. He trusts no one and keeps his partner at arm’s length. Remy has seen enough evil brought about by humans on other humans that he's lost faith in the goodness of people. He walks a fine line between the psychological stages of disenchantment and full-blown cynicism. So what makes him different than any other fictional tortured cop hero? Well, let me see if I can sum it up. He avoids any and all casual relationships with women. He won't be left vulnerable again. Until the heroine, Cody Lewis enters his domain and then all bets are off. Remy is a charmer, a bit of flair I pulled in from his Cajun upbringing. Everyone pretends to be something they're not. But Remy must. In an effort to protect any lasting connections to himself in New Orleans, he's had to bury his Cajun heritage, his accent and his native language. His past is gone. Remy has polished himself into a person he wasn't sure he wanted to be. And little by little, Cody starts to unravel his finely woven web of lies. There's more to Remy LeBeau, and if you stick with the Degrees of Darkness series, you'll find out just what makes this displaced Cajun detective really tick. had lit up Cody’s eyes when he taunted her about being the best. Apparently, she didn’t like having her boasts thrown back at her. The cowgirl needed someone to keep her on her toes. Hopefully the ME had arrived before the rain. Remy peered through the deluge at the long, white horse trailer hooked to a cherry-red extended cab truck. It appeared someone was inside. Upturning the collar of his coat and hunching his shoulders, Remy jogged across the lot. He circled to the back of the trailer and entered, keeping a good distance back. A man in a blue ME jacket knelt beside the victim sprawled on the rubber-matted floor. The air was filled with the stench of blood, death, and manure. Remy preferred the manure. 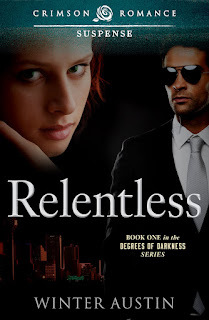 Winter will be giving away an e-Book copy of RELENTLESS to one person leaving a comment or email. I like to see everyone get their chance at happiness even if they think they do not want it, need it, or deserve it. Cops, love what they do for us everyday... growing up around the police station... cops have always been special to me... Remy sounds like he has a very interesting story to share with us! Congrats on this release! Yes, they do, Colleen. Thanks so much for stopping by! The rose is very interesting & scary I'd say. This is going to be a great read. Sometimes a being a cop could leave one in a dark place. That's why when someone comes along, especially if that someone is the light in the darkness, he would need to fight his way back from that dark place. I love these revelation stories. Thanks, Mary and Kai. I like good twists. Hmm...wasn't expecting the rose...wasn't expecting the charm in your initial description, either. Remy seems like an interesting character. Ohh, Remy sounds like my kind of hero. Fabulous excerpt Winter! Remy sounds great, I'd love to see how your displaced Cajun detective allows himself to fall in love -- interesting, Winter! caitosullivan(at)ymail(dot)com. Many best wishes for lots of sales! Remy sounds like an intriguing hero. This sounds like a really great book! Thanks for the giveaway. quick cash with we have observed advertisements for quick cash loans each day quick cash with.